I started cross-stitch by buying mini-kits that I could complete in several sessions in a waiting room. I then decided to attempt a large kit of a wizard. It took me two years but the result was beautiful. It hangs in my sons' bedroom. 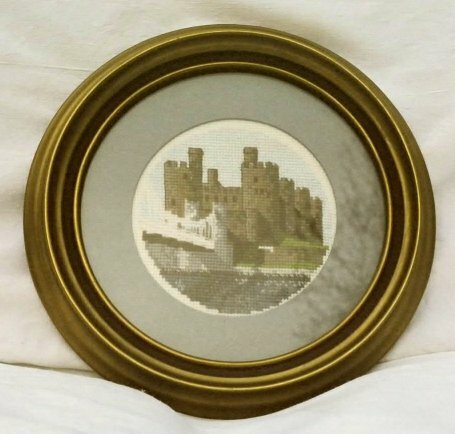 A cross-stitch kit purchased while on holiday in Wales. We had toured Conwy Castle and, of course, you end up in the gift shop. My kids spotted the kit and immediately pointed it out to me. I got to start it while I was still on holiday! 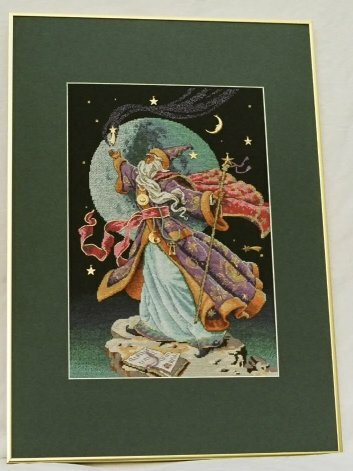 I had done so many small kits or patterns in cross-stitch that I thought I would like to put that accumulated time toward doing a big picture. I am happy with the result but it did take a couple of years in waiting rooms to finish this one! The disadvantage is that you can't put it in your pocket. It needs a dedicated bag and a binder for the pattern (which I enlarged, of course).